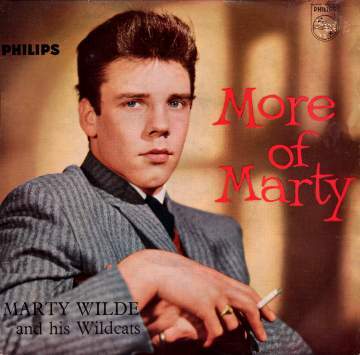 Marty Wilde had been discovered by rock and roll entrepreneur Larry Parnes who was keen to expand his management of young hopefuls beyond his first signing Tommy Steele. At that time Marty had already changed his name from 'Smith' to 'Patterson' but Parnes, in line with his thinking for all his stars, changed the name entirely creating 'Marty Wilde'. Marty's big break came with the advent of the UK's first rock and roll TV show, Jack Good's 'Six-5 Special', where his good singing voice made him a great asset. Not only could Wilde 'rock and roll', but he could also sing ballads. This ability led to his version of Jody Reynolds US hit 'Endless Sleep', which was one of many cover versions that Marty Wilde was called upon to make. All of these covers were well done, some like 'Endless Sleep' were arguably superior to the original, but this lack of his own material would prove a big handicap. Marty transferred himself to Jack Good's new ITV show 'Oh Boy!' following the BBC's foolish dismissal of Jack Good. He was the star of that show when Cliff Richard suddenly appeared, riding high from the issue of his first record, 'Move It!'. The two stars allegedly got on well but Larry Parnes decided to pull Marty out of the show rather than risk him being seen as a subsidiary act to Cliff. In retrospect, Parnes would regret this move because it enabled Cliff to quickly assume Marty's former role as the UK's foremost rock and roll star. Although Marty's covers of US songs continued to chart they were in direct competition with the originals and by the early 1960s Marty was struggling to make even the top 20. Despite the downward slide in his record sales most of his records were well made. However, the competition from the US and from Merseybeat was too great and even his wonderful, self penned, 'Come Running' failed to chart. Marty Wilde married Vernons girl 'Joyce Baker' and later in the 1960s he created an unsuccessful trio with himself, Joyce, and Justin Hayward- the 'Wilde Three' . Fortunately, Marty had a loyal base of fans- particularly in the North of England which enabled him to ride out the 'group' obsession. He later re-established himself as a premier act at rock and roll nostalgia concerts. He took sufficient time off from this to help his daughter Kim Wilde become a major international star, before she retired to landscape gardening. Marty still tours regularly and retains that excellent singing voice that gave him such a good start in his long show business career. The EP on the left "More Of Marty" on BBE12200 is like most of Marty's work on that format- hard to find in good condition, and generally expensive when you find it. It shows a very young looking Marty in what was then quite a fashionable pose- relaxing with a cigarette. The EP contains both sides of his first two full 45 single releases (Honeycomb was only sold on 78 or for jukebox), one of which is very difficult to find. BBE12327 1959 "Sea Of Love"
BBE12385 1960 "Versatile Mr. Wilde"
BBE12422 1960 "Marty Wilde Favourites"